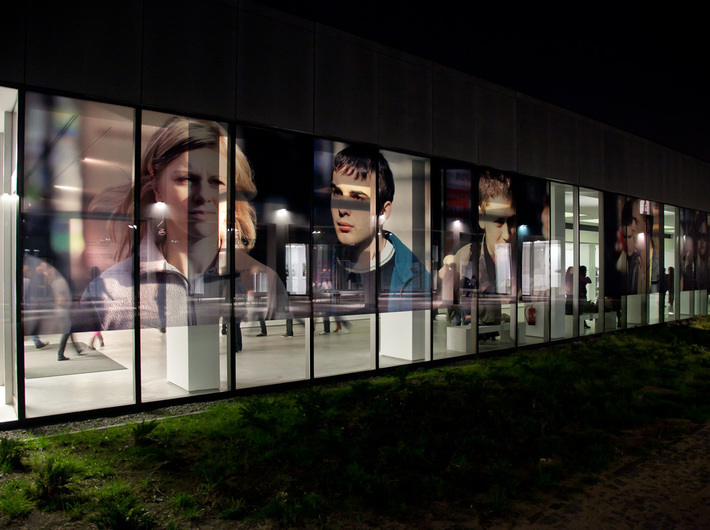 Museums at Night at MOCAK will run under the slogan In Art We Trust! Visitors will be be awarded ‘mocaks’, banknotes designed specially for the occasion, which will enable them to get free entry tickets to the Museum, valid until the end of 2013! First of all, do have a look around our recently opened exhibitions: Economics in Art, the MOCAK New Collection, and the two exhibitions taking place as part of the Photomonth in Krakow: Tadeusz Rolke and Ghislain Dussart. Participants in our Museums at Night will be able to visit our new Re Gallery, located in the Gatehouse of the former Schindler Factory. The Gallery will be used to display the works of art students from Poland and all over the world. Visitors will have an opportunity to listen to a recording of the concert that will have inaugurated the activities of the gallery during its opening the day before, on 16 May, performed by the students of the Studio of Spatial Activities (PDP) at the Academy of Fine Arts in Warsaw, conducted by Prof. Mirosław Bałka. The PDP Orchestra will perform a music piece inspired by the history and culture of Krakow. On the occasion of Museums at Night, all bookworms are welcome to borrow books from the collection at our Library. As part of the action MOCAK at Zachęta, Zachęta at MOCAK, residents of Krakow will have an opportunity to view a screening presenting works from the National Art Gallery in Warsaw, and the Varsovians – a chance to see a presentation of the Collection of the Museum in Krakow. During the workshops at the MOCAK Library, as a group effort, participants will create pages for a one-off book object. Professor Mieczysław Porębski (1921–2012) donated to the Museum a part of his library, as well as paintings by his friends, including members of the Grupa Krakowska, and also by Ryszard Winiarski, Jerzy Stajuda, Jan Tarasin and Andrzej Wróblewski. The Professor’s collection has been placed on display in one of the rooms of MOCAK Library, organised to resemble the layout of the study in his Krakow apartment. During Museums at Night, there will be special promotional offers at the MOCAK Bookstore: 25% discount on all museum publications and 5% on all other purchases of more than 150 PLN . There will also be a prize draw for all those who bought an item at the MOCAK Bookstore during the event. To enter, you have to fill in a form and answer a question about our new exhibition. The draw will take place at midnight.